As a Youth IT Careers business partner, you can make a real difference by helping a young person who has faced disadvantage begin their journey in the workforce. Employment: Provide employment and a supportive work environment for a graduate and help them kick start their career. Training: Join us as an industry educator in the pre-employment course as a guest speaker, or through hosting workplace industry tours to give students an introduction to workplace structure. Mentoring: Sign yourself or your staff up as an industry mentor to our students. If you're looking for a new recruit, find out how your organistion can get involved. 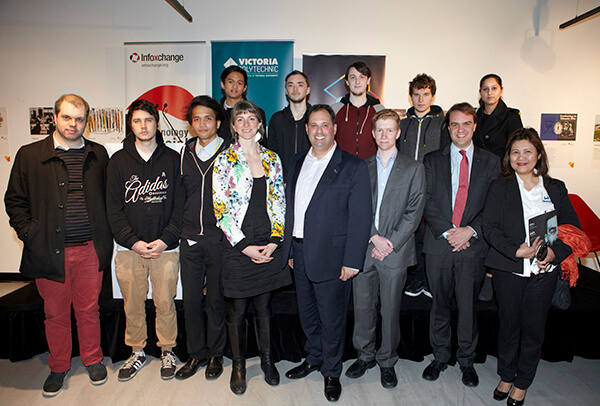 Minister Philip Dalidakis at a Youth IT Careers event with students and Infoxchange staff. Our organisation wants to recruit a graduate, what's involved? You don’t need to be an IT company. You just have to be willing to give a young person a helping hand to start their career. Find out more about how your organisation can get involved in Youth IT Careers, or drop us a line - we'd love to hear from you. Youth IT Careers gives young people, who face significant barriers to employment, their first step towards an IT career. Established with Microsoft, Youth IT Careers provides IT training and employment opportunities. In this video, hear how George Sinis, Director at Inspired Printing, met a Youth IT Careers trainee who helped transform his business. Find out how your organisation can get involved in Youth IT Careers. The pre-employment program includes a Certificate II in Information, Digital Media and Technology and modules from the Microsoft IT Academy. During the program, students will attend guest lectures from IT industry professionals and have the opportunity to visit businesses to give students a clearer idea of what a career in IT might look like. Once training has been completed students are supported into employment opportunities with a Youth IT Careers business partner. Infoxchange is not currently running the Youth IT Careers Program. Victoria Polytechnic run a modified version of the program. For more information on the program please contact Patrick O’Neill [email protected] or visit the VU website. For more information, click below to download the Youth IT Careers brochure.